While some seniors are content to retire, relax and enjoy life at a leisurely pace, there are many others determined to live life to its fullest. 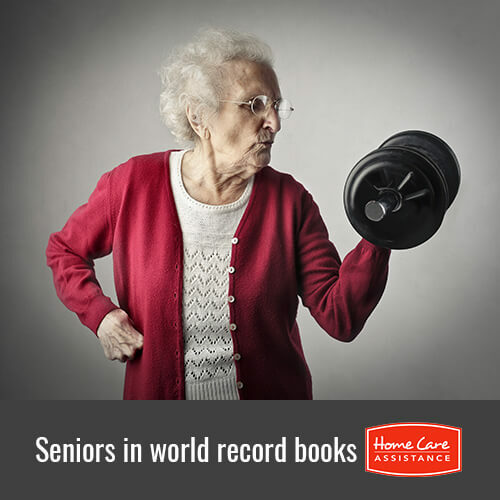 The feats accomplished by a select group of older citizens helped them gain entry into the Guinness Book of World Records and inspire both seniors and Rhode Island home caregivers. Read about five of these awe-inspiring seniors in the article below. Fitness instructor and writer Charlotte Guttenberg from Melbourne, Florida, is a living work of art. She will be entered into the Guinness Book of World Records in 2017 for being the most tattooed female senior citizen. More than 91 percent of her body is covered in colorful ink. Helmke is Guttenberg’s significant other. In fact, the two met in a tattoo parlor. With more than 93 percent of his body covered in vibrant art, he too was entered in the Guinness Book of World Records at the same time as his ladylove. Mr. Miyasaki spends his days training and staying in shape so that he may continue sprinting competitively. He was entered into the Guinness Book of World Records in 2015 for being the oldest competitive sprinter. Although he completed the 100-meter dash in 42.22 seconds, he was disappointed that he was not faster. By the time San Antonio attorney was 69 years old, he was entered in the Guinness Book of World Records for the fourth time in 2013. He managed to run 239 marathons and more than 6,261 miles in a single year. He began the hobby in 1996. By 2008, Macon completed 105 marathons and his first world record. He ran 113 marathons in 2012 and 255 marathons in 2013. A fear of heights never plagued Mrs. Long, who took up the sport of abseiling at the age of 85. In 2015, at the age of 101, she joined a group of like-minded adventurers and abseiled down the side of the 560-foot (170 meter) Spinnaker Tower in Portsmouth, UK. The feat was the 14th for Mrs. Long. She became the oldest person to abseil and was entered in the Guinness Book of World Records. While not all seniors are physically able to do what these seniors have done, they can take away a very important lesson: you’re never too old to make your mark on the world. Help your loved one make the most of his or her golden years with Home Care Assistance. Our premier Rhode Island elderly care encourages seniors to lead active healthy lives to promote both longevity and vitality. Call (401) 284-0979 today to learn more about our services and how they can be customized to help your loved one.